Things are a little busy around here! I'm in the process of buying a house (fingers crossed!!) but in the meantime my old lease was up so I moved into a sublet for the summer. I've moved but my plants are in two different places (what, you thought I wouldn't move my plants? 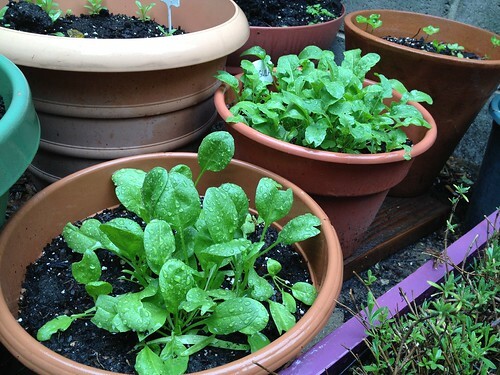 Another bonus of container gardening! ): about a quarter of my plants are at my sublet and the rest are on my boyfriend's porch. If all goes well with the house I'll start moving plants over there after closing at the end of this month. 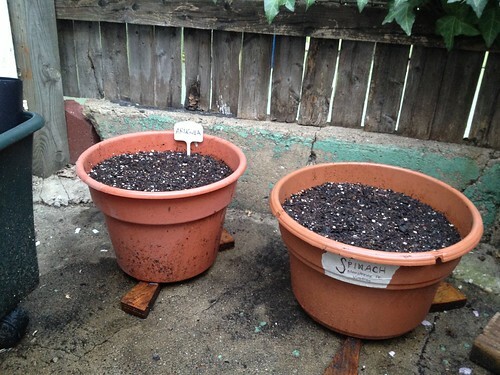 But just because my plants are being carted around the city doesn't mean they aren't growing. Oh, they are. I was going through all the pictures I've taken so far this year and I thought it would be fun to see how the plants have grown. 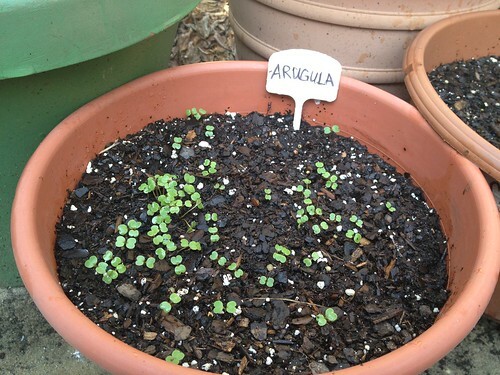 I thought the arugula was a particularly nice example: [caption id="" align="alignnone" width="500" caption="March 11th"] [/caption] Above, in mid-March they were freshly planted. 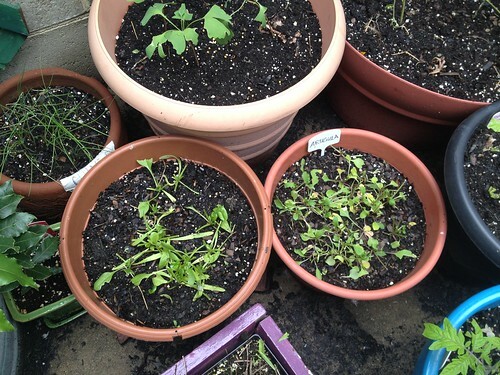 [caption id="" align="alignnone" width="500" caption="March 18th"] [/caption] A week later they sprouted! [caption id="" align="alignnone" width="500" caption="March 22nd"] [/caption] They grow fast! 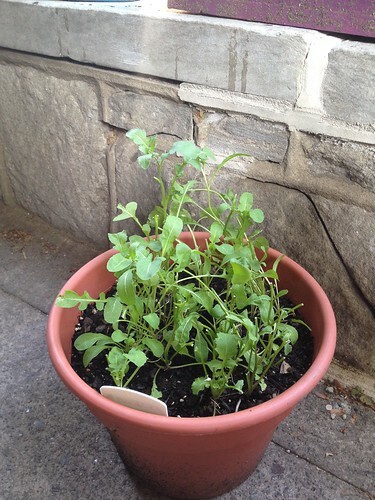 Four days later I started thinning them out (because apparently I am incapable of sowing seeds evenly...) [caption id="" align="alignnone" width="500" caption="April 16th"] [/caption] By mid-April they were starting to look like real arugula (and tasted great, too.) 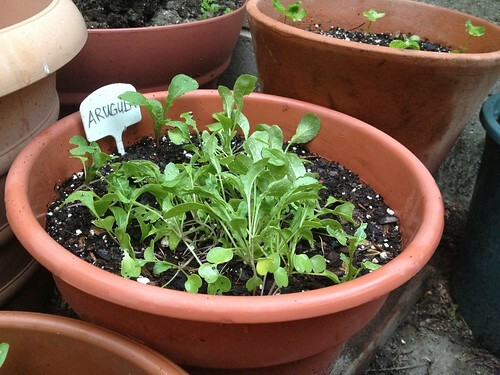 [caption id="" align="alignnone" width="500" caption="April 22nd"] [/caption] The front pot is spinach and behind it is the monstrous arugula. [caption id="" align="alignnone" width="500" caption="May 3rd"] [/caption] I tried to eat as much as I could to thin them out some more. When I say "thin out" I don't mean pulling the plants out of the ground - I just pick the leaves so new ones can grow back. 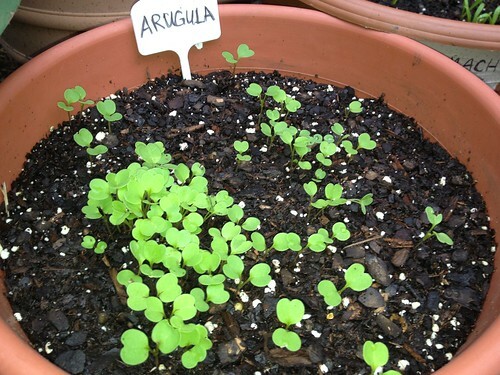 Because... [caption id="" align="alignnone" width="500" caption="May 18th, arugula on the right"] [/caption] They will! [caption id="" align="alignnone" width="375" caption="May 18th again"] [/caption] After I thinned out what I could eat for dinner, I moved some plants to a bigger space so I wouldn't have to thin out as frequently and they'd be able to grow a little bigger - although I tend to prefer baby greens for their tenderness, I love the nutty flavor of adult arugula because it's more pronounced. 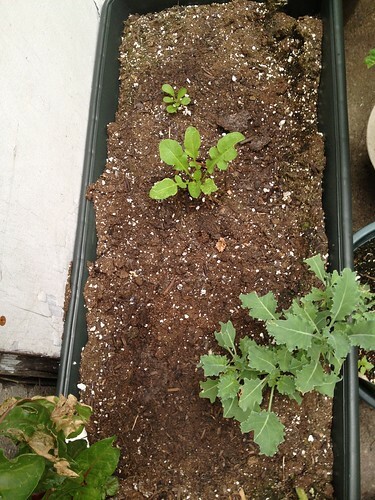 Also I wanted the leaves to look more arugula-ish. 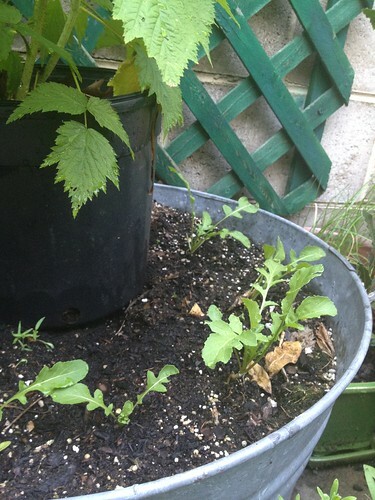 [caption id="" align="alignnone" width="375" caption="May 24th"] [/caption] I stuck the little arugulas in wherever possible (like with my chard and kale from last winter that were basically just bird food by now) but they grew big with lots of space. 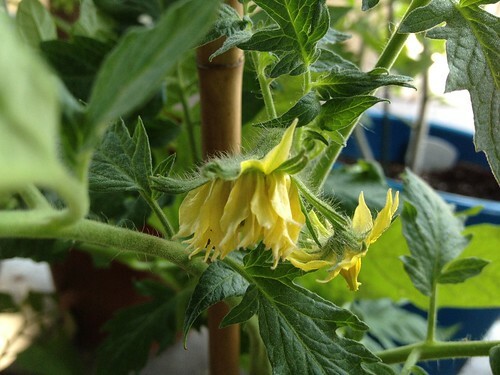 [caption id="" align="alignnone" width="375" caption="May 24th again, blurrily"] [/caption] The ones I left in the original pot grew lots too. [caption id="" align="alignnone" width="375" caption="May 28th"] [/caption] Four days later they were enjoying their new home and steadier photography! 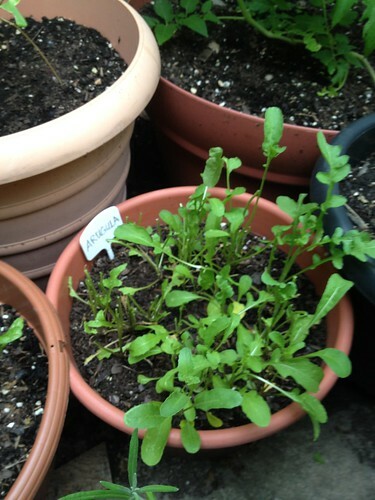 [caption id="" align="alignnone" width="500" caption="May 31st"] [/caption] And I was eating as much arugula as possible. 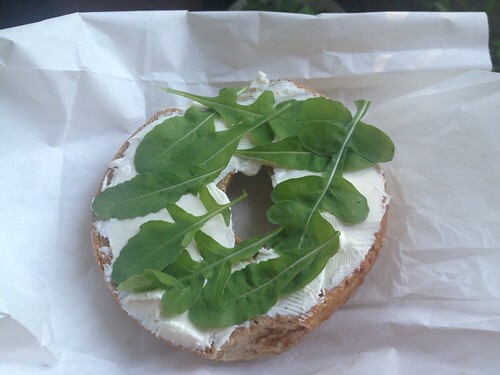 Don't knock arugula and cream cheese on a bagel until you've tried it. This might be the last harvest since tender greens like these don't like it really hot (I've already gotten rid of the spinach and lettuce.) 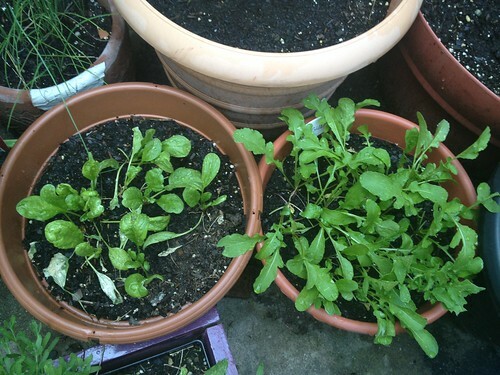 And I've eaten enough arugula to satisfy my springtime arugula craving, but I'll probably plant more in the fall when it cools down. As for the rest of the garden ("garden"), I'm getting lots of these: [caption id="" align="alignnone" width="500" caption="nice to see you"] [/caption] which is always exciting! But more on that next time.